The future is low carbon. Economies the world over are making the transition. Canada’s actions today on climate, energy, trade, innovation, and skills will shape its economic prosperity for decades to come. A global transition to a low-carbon economy is afoot. Markets for low-carbon goods and services (LCGS) are expanding. The upward trend in global investments in renewable and “clean” energy weathered the economic downturn of 2008 and 2009 and remains strong, with investments growing by 30% over the past two years. Nations are seeking first-mover advantages in this global transition. Several have issued lowcarbon growth plans, aiming to reduce the energy and emissions intensity of their economies all the while building on their existing competitive advantage. Carbon is increasingly a factor in global trade. Absent a cohesive global climate regime, countries are starting to employ trade measures to limit the entry of highcarbon goods and help achieve objectives for mitigating domestic emissions. Understanding the implications of the global low-carbon transition for Canada and making choices that maximize the opportunities and minimize the risks are critical to Canada’s long-term prosperity. Taking stock of the growing global and domestic demand for LCGS and the opportunity that exists for Canadian firms to meet this demand is fundamental to designing policies that promote current LCGS sectors and grow new ones. Canada can only gain from this. But that is only part of the story: Canada will inevitably need to cut carbon emissions across traditional sectors of the economy. A challenge for Canada is to define a long-term path that takes it from the energy and emissions-intensive economy of today to a future that harnesses innovation and skills to achieve real emissions reductions and drive sustainable resource use. What strategies are available to Canada in an increasingly carbon-constrained world? What are the payoffs if Canada gets it right, the consequences if it gets it wrong? What roles do governments, the private sector, and citizens play? With this report, the National Round Table on the Environment and the Economy (NRT) lays the foundation for a low-carbon growth plan for Canada. The report brings to a close the NRT’s Climate Prosperity series, a policy research initiative spanning three years and six major publications that explores the economic risks and opportunities of climate change for Canada. 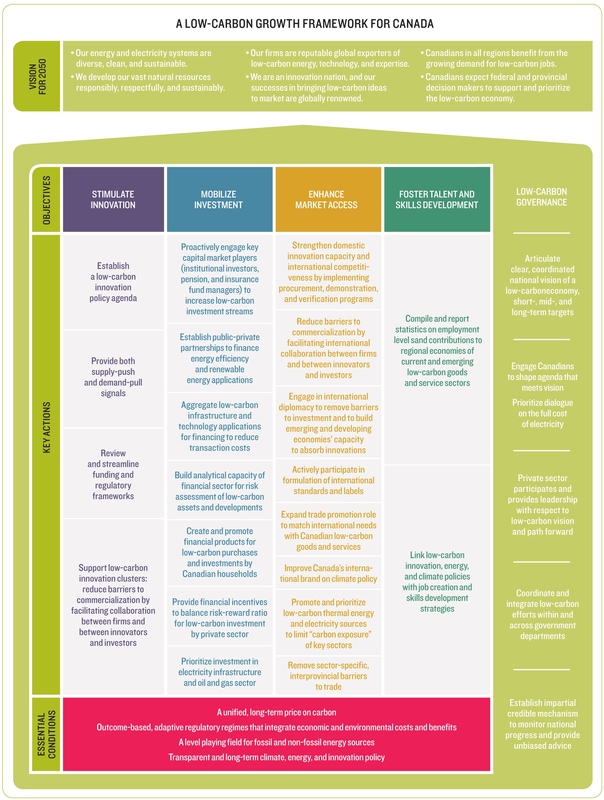 In this report, we combine original economic modelling and qualitative analysis with the perspectives of close to 150 regional stakeholders and subject-matter experts for two purposes: raise awareness of the implications of a carbon-constrained world for our country and set out a framework for action to seize the economic opportunities and maximize Canada’s competitiveness under future global carbon constraints. Canada needs a low-carbon growth plan. This is a basic conclusion of our analysis and of the feedback received from regional stakeholders. The reality is that Canada is unprepared to compete in a carbonconstrained world. Despite a growing cleantech sector, challenges remain in bringing low-carbon ideas to market. Although venture capital investments in cleantech are at a healthy level, overall low-carbon investment and investor confidence is low. Canada’s current market share as a global supplier of LCGS is far from what it could be. Canada’s LCGS sectors could well face labour shortages in a world competing for skills and innovative talent. Regional emissions profiles and related economic interests differ markedly and have precluded a comprehensive, long-term approach to climate policy to date. Canada’s competitors and trading partners are actively planning for and initiating low-carbon growth. Canada needs a low-carbon growth plan that builds on strengths, involves all governments, engages the private sector, and makes good use of market signals. This plan needs to be developed with clear objectives and through focused consultations. It should also be built on a strong foundation. Based on extensive research and stakeholder consultations, we offer a low-carbon growth framework for Canada, which sets out this foundation. The NRT’s framework includes a low-carbon vision for our country and the objectives, key actions, essential conditions, and governance required to achieve it. // innovators with renowned successes in bringing low-carbon ideas to market. // citizens and decision makers in public and private sectors stay committed to meeting low-carbon goals. TO ACHIEVE THIS VISION, THE NRT RECOMMENDS KEY ACTIONS ALONG FOUR OBJECTIVES. FIRST, federal and provincial governments need to stimulate low-carbon innovation. Many actions are important: putting low-carbon priorities on innovation policy agendas; providing incentives to undertake and foster demand for low-carbon innovations; reviewing and streamlining funding programs and frameworks within which innovation occurs; and establishing innovation clusters to bring together innovators, potential users of the innovation, and investors. SECOND, public and private sectors need to mobilize investment in low-carbon infrastructure and technology. Public investment is insufficient to finance Canada’s low-carbon transition. Government actions that engage key players like institutional investors and balance the risk-reward ratios for low-carbon investment will be necessary to leverage private-sector capital. Financial institutions, too, play a role: they should create new vehicles for low-carbon investment; seek economies of scale in evaluating lowcarbon proposals to facilitate project finance; and build their advisory capacity on technical, regulatory, commercial and financial risks of low-carbon technologies and projects. Partnered approaches that bring ownership of low-carbon goods such as electric vehicles within Canadians’ reach are also important. THIRD, federal and provincial governments need to enhance Canadian firms’ access to fast-growing low-carbon markets. Governments should expand trade promotion activities, make better use of diplomacy and international standards-setting processes, and create domestic procurement policies and technology verification programs to increase Canada’s market share as a global supplier of LCGS. Federal action to rein in carbon emissions and contribute to multilateral climate initiatives will be necessary to strengthen Canada’s “brand” internationally. Tackling interprovincial barriers to trade and augmenting low-carbon thermal energy and electricity sources are key actions to bring down the emissions intensity of the Canadian economy overall and that of economically important resource sectors. FOURTH, federal and provincial governments need to work together to foster low-carbon talent and skills development. As Canada transitions to a low-carbon economy, human resource requirements will shift. Governments should move quickly to compile official statistics on skills requirements and employment levels in LCGS sectors and related occupations. At the same time, governments can make use of existing information on known demands for low-carbon skills to link innovation, energy, and climate policies to job creation and skills development strategies. // adaptive and outcome-oriented policy and regulatory approaches. Leadership by the private sector — in articulating a vision for Canada’s low-carbon future and determining the path to achieving it — will be critical to progress and success. WHAT IF WE DON ’T MOVE NOW ? The potential consequences of Canada’s collective failure to act promptly sum up as follows: missed opportunities and growing economic risk. In the global low-carbon transition, firms supplying low-carbon goods and services will make money. Annual global spending on LCGS is significant and growing quickly. Spending stood at roughly $339 billion in 2010. Our analysis shows that global spending could reach between $3.9 and $8.3 trillion by 2050, depending on climate policy assumptions. The growth potential in Canada is also notable. Taking into account existing and proposed climate policies, annual domestic spending on LCGS could rise from the $7.9 billion estimated for 2010 to $36 billion in 2050. Climate policies that cut emissions by 65% from 2005 levels could drive domestic spending of roughly $60 billion in 2050. In either scenario for 2050, LCGS sectors grow more rapidly than the Canadian economy overall. Provided we as a nation go about it strategically, Canadian firms can become global suppliers of lowcarbon technologies, services, and know-how, and Canada can become a global player in low-carbon markets. Canada’s diverse and abundant low-carbon natural resources, highly educated workforce, research capacity, advanced manufacturing skills, and strong institutions are but a few reasons to support this. The challenges our nation faces in bringing down the energy and emissions intensity of its economy also present opportunities. For example, solutions to cutting emissions from transportation, Canada’s single largest source of emissions, could target export markets. To remain competitive in a global low-carbon economy Canada needs to do more than harness the lowcarbon opportunities available to it. Governments should build on the current discussions about a Canadian energy strategy and put in place stringent climate policy that would affect the country’s economic make-up. The economic risks of inaction are too significant to ignore. For one, billions of dollars in Canadian exports could be subject to trade measures that penalize emissions-intensive industries and products. For another, our international reputation could suffer and with it the marketability of Canadian products and the ability of Canadian firms to invest abroad. The cost of policy delay is also clear. Every year of delay in sending strong, economy-wide policy signals represents a wasted opportunity to take advantage of natural cycles of infrastructure and equipment renewal, making it more difficult and expensive to meet emissions reduction targets. Our analysis shows that waiting until 2020 to implement climate policy aimed at cutting emissions by 65% from 2005 levels by 2050 implies close to $87 billion in refurbishments, retrofits and premature retirement of assets. Canada needs to move quickly to seize the opportunities and manage the risks inherent in a low-carbon future. The NRT offers a framework for action to get going. Our country’s approach will be uniquely Canadian, and will undoubtedly involve course corrections along the way, but it needs to start now.